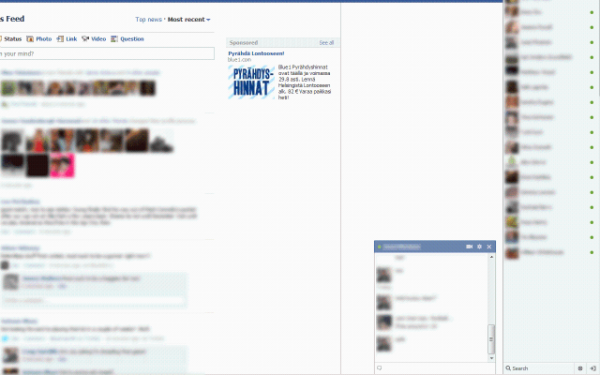 Facebook fairly recently made a change to Facebook Chat that is irritating many users of the site. The chat interface, displayed in the lower right corner of the screen is now not only listing contacts who are online, but also those who are not. To make matters worse, online and offline friends are mixed in the listing. 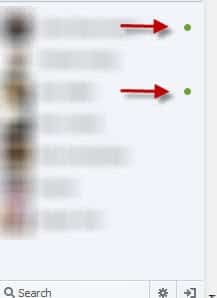 The only way to identify online contacts is the green icon next to the contact's name. It is not really clear why offline contacts are displayed next to online contacts there. Update: The interface was changed again on Facebook. All online contacts are now listed at the top of that page so that you do not run into issues anymore here in this regard. The scripts listed below are not necessary anymore, and they appear to have been pulled by their authors. We have removed the links as a consequence. While it is possible to send messages to offline chat partners, it is probably not something that a lot of Facebook users would want to do, as they could use the site's messaging options instead for that. Messages send to offline chat partners are displayed to them the next time they come online. Some Facebook users may prefer to hide offline chat partners from Facebook Chat to increase the visibility of the feature. The following extensions and scripts let you hide all offline contacts from Facebook's Chat window. Firefox add-on: Tidy Facebook Chat This add-on for the Firefox browser hides all Facebook contacts who are currently offline from the friend's listing in the sidebar. Google Chrome: Facebook Chat Fix This add-on shows only online friends on Facebook in the chat bar. It furthermore hides the mini news-feed that you see on the site as well. Userscript (Firefox, Google Chrome, Opera): Facebook Old Chat Sidebar This one is the most sophisticated option of them all. It returns Facebook to the old chat interface. It hides offline friends, so that only online and idle friends are shown, orders friends by first name, displays the total number of online friends and groups friends by status. That's not all though. It automatically adjusts the size of the chat bar and makes the chat bar stick to top. The userscript is probably the best choice as it offers more customizations and options than the browser extensions. 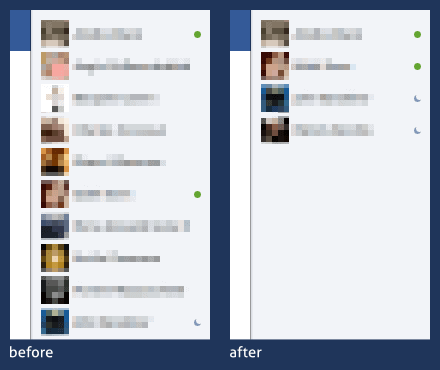 Tiny FB chat 0.1.3 for FF does work but the new photo viewer doesn’t work when it is enabled.